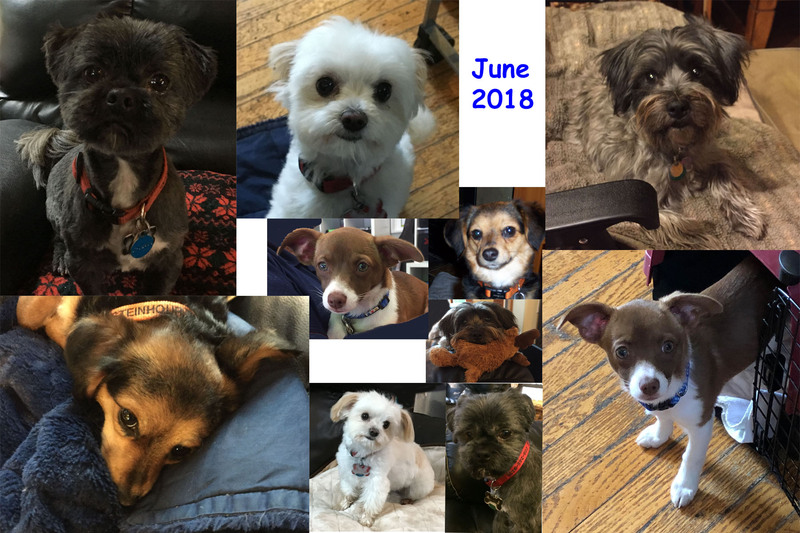 Outer ring, clockwise starting at upper left: Dusty, Mindy, Monte, Bailey, Dusty, Mindy, Mika. Inner ring, clockwise from left: Bailey, Mika, Monte. Dusty (born January 30, 2010) lived with a colleague of Maryrita's until April, 2011, when his family could no longer take care of him. He was named "Hades" but we quickly renamed him "Dusty". Dusty (DNA results) is a Shorkie (Shih-Tzu / Yorkshire Terrier); mostly Shih-Tzu with a little Yorkie and a tiny bit of Pekingese. Monte (born July 20, 2009) was adopted from the Seattle Humane Society on June 4, 2013. He was originally named "Carter", but seemed to be much more of a "Montgomery" or "Monte". Monte (DNA results)is a Terrier mix: a Shih-Tzu / Yorkie / Maltese cross. Mika and Mindy (born March 7, 2015) were adopted from Ginger's Pet Rescue on May 1, 2015. They're part of a litter of five: three girls and two boys. Mom is Opal, and was rescued from a California shelter. Mika (DNA results) is a Chihuahua, Bichon Frise, Cocker Spaniel, Maltese, and Pomeranian mix. Mindy (DNA results) is a Chihuahua, Bichon Frise, Cocker Spaniel, and Maltese mix. They are certainly NOT the Havanese / Poodle mixes we were told! Bailey (born either February 20 or 24, 2018) was adopted from Motley Zoo Pet Rescue on June 2, 2018, transferred there from a California shelter. She was originally named "Gert Yorkes", but because of her color, we named her "Bailey's Irish Cream" - Bailey for short. The website claimed she's a terrier mix, but clearly has Chihuahua in her. © Maryrita and Curtis Steinhour, 2018.